This article is about the class of jawless fish. For the ancient order of stenolaemate bryozoans, see Cyclostomatida. Cyclostomata is a group of chordates that comprises the living jawless fishes: the lampreys and hagfishes. Both groups have round mouths that lack jaws but have retractable horny teeth. The name Cyclostomata means "round mouths". Their mouths cannot close due to the lack of a jaw, so they have to constantly cycle water through the mouth. This taxon is often included in the paraphyletic superclass Agnatha, which also includes several groups of extinct armored fishes called ostracoderms. Most fossil agnathans, such as galeaspids, thelodonts, and osteostracans, are more closely related to vertebrates with jaws (called gnathostomes) than to cyclostomes. Cyclostomes seem to have split off before the evolution of dentine and bone, which are present in many fossil agnathans, including conodonts. Biologists disagree about whether cyclostomes are a clade. 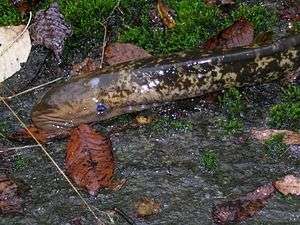 The "vertebrate hypothesis" holds that lampreys are more closely related to gnathostomes than they are to the hagfish. The "cyclostome hypothesis", on the other hand, holds that lampreys and hagfishes are more closely related, making cyclostomata monophyletic. Most studies based on anatomy have supported the vertebrate hypothesis, while most molecular phylogenies have supported the cyclostome hypothesis. There are exceptions in both cases, however. Similarities in the cartilage and muscles of the tongue apparatus also provide evidence of sister-group relationship between lampreys and hagfishes. And at least one molecular phylogeny has supported the vertebrate hypothesis. The embryonic development of hagfishes was once held to be drastically different from that of lampreys and gnathostomes, but recent evidence suggests that it is more similar than previously thought, which may remove an obstacle to the cyclostome hypothesis. There is at present no consensus on the correct topology. Both hagfishes and lampreys have just one gonad, but for different reasons. In hagfishes it is because only a single gonad is developed during their ontogeny, while it is achieved through the fusion of gonads in lampreys. Unlike jawed vertebrates, which have three semicircular canals in each inner ear, lampreys have only two and hagfishes just one. But the semicircular canal of hagfishes contains both stereocilia and a second class of hair cells, apparently a derived trait, whereas lampreys and other vertebrates have stereocilia only. Because the inner ear of hagfishes has two forms of sensory ampullae, their single semicircular canal is assumed to be a result of two semicircular canals that have merged into just one. The hagfish blood is isotonic with seawater, while lampreys appears to use the same gill-based mechanisms of osmoregulation as marine teleosts. Yet the same mechanisms are apparent in the mitochondria-rich cells in the gill epithelia of hagfishes, but never develops the ability to regulate the blood's salinity, even if they are capable of regulating the ionic concentration of Ca and Mg ions. The lamprey intestine has a typhlosole that increases the inner surface like the spiral valve does in some jawed vertebrates. The spiral valve in the latter develops by twisting the whole gut, while the lamprey typhlosole is confined to the mucous membrane of the intestines. The mucous membranes of hagfishes have a primitive typhlosole in the form of permanent zigzag ridges. This trait could be a primitive one, since it is also found in some sea squirts such as Ciona. The intestinal epiphelia of lampreys also have ciliated cells, which have not been detected in hagfishes. Because ciliated intestines are also found in Chondrostei, lungfishes and the early stages of some teleosts, it is considered a primitive condition that has been lost in hagfishes. ↑ Duméril, A.M. Constant (1806). Zoologie analytique, ou me´thode naturelle de classification des animaux, Rendue plus facile a l'Aide de Tableaux Synoptiques. Paris: Allais. ↑ Zhao Wen-Jin; Zhu Min (2007). "Diversification and faunal shift of Siluro-Devonian vertebrates of China". Geological Journal. 42 (3–4): 351–369. doi:10.1002/gj.1072. ↑ Sansom, Robert S. (2009). "Phylogeny, classification, & character polarity of the Osteostraci (Vertebrata)". Journal of Systematic Palaeontology. 7: 95–115. doi:10.1017/S1477201908002551. ↑ Baker, Clare V.H. (December 2008). "The evolution and elaboration of vertebrate neural crest cells". Current Opinion in Genetics & Development. 18 (6): 536–543. doi:10.1016/j.gde.2008.11.006. PMID 19121930. 1 2 Delabre, Christiane; et al. (2002). "Complete Mitochondrial DNA of the Hagfish, Eptatretus burgeri: The Comparative Analysis of Mitochondrial DNA Sequences Strongly Supports the Cyclostome Monophyly". Molecular Phylogenetics and Evolution. 22 (2): 184–192. doi:10.1006/mpev.2001.1045. PMID 11820840. ↑ Stock, David; Whitt GS (7 August 1992). "Evidence from 18S ribosomal RNA sequences that lampreys and hagfishes form a natural group". Science. 257 (5071): 787–9. doi:10.1126/science.1496398. PMID 1496398. Retrieved 22 November 2011. ↑ Janvier, Philippe (2003). Early Vertebrates. Oxford University Press. pp. 1–408. ISBN 978-0-19-852646-9. ↑ Kuraku, Shigehiro; Meyer, Axel & Kuratani, Shigeru (2009a). "Timing of Genome Duplications Relative to the Origin of the Vertebrates: Did Cyclostomes Diverge before, or after?". Molecular Biololgy & Evolution. 26 (1): 47–59. doi:10.1093/molbev/msn222. PMID 18842688. ↑ Heimberg, Alysha M.; Cowper-Sallari, Richard; Sémon, Marie; Donoghue, Philip C. J.; Peterson, Kevin J. (9 November 2010). "microRNAs reveal the interrelationships of hagfish, lampreys, and gnathostomes and the nature of the ancestral vertebrate". PNAS. 107 (45): 19379–19383. doi:10.1073/pnas.1010350107. PMC 2984222 . PMID 20959416. ↑ Yalden, D.M. (1985). "Feeding mechanisms as evidence for cyclostome monophyly". Zoological Journal of the Linnean Society. 84 (3): 291–300. doi:10.1111/j.1096-3642.1985.tb01802.x. ↑ Kuratani, Shigeru & Ota, Kinya G. (2008). "Hagfish (Cyclostomata, Vertebrata): searching for the ancestral developmental plan of vertebrates". BioEssays. 30 (2): 167–172. doi:10.1002/bies.20701. PMID 18197595.